The man suspected of shooting three Park County Sheriff's Office deputies wrote on Facebook just last month that "I am a high value target" and "cops want me dead." Martin Wirth titled a Facebook post last month, "Cops draw guns on former Senate candidate for attempting to purchase car insurance." Wirth had run for office in 2014. After six long paragraphs in the Facebook post dated Jan. 22, he said, "One cop repeatedly punched my face and knocked two of my teeth out after others piled on. This was after aiming loaded pistols while screaming threats at me. I may have provoked them with a finger or gave them the skunk eye. Then I turned my back to go home. They were about to open fire." Wirth said, "It's better to be shot in the back while unarmed because the coroner will usually record that as a homicide." Wirth admitted in the post that his driver's license had been revoked because he refused to pay for a speeding ticket. That wasn't the only thing he refused to pay. He refused to pay his mortgage company. Investigators said Wirth was shot and killed after he opened fire on three deputies serving an eviction notice. Wirth had been fighting eviction for years, according to Colorado Foreclosure Resistance Coalition website . Financial woes likely contributed to the legal action to evict him from the ranch home at 36 Iris Drive in Bailey, where he'd lived in since about 1998. In 2008, a debt-collection firm called Asset Acceptance LLC won a $12,292 judgment against Wirth, court records state. In 2006, North Star Capital Acquisition LLC won a $14,908 judgment against him. 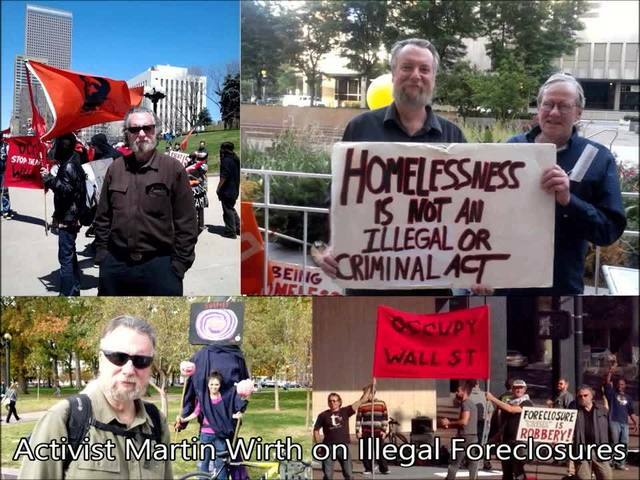 The foreclosure resistance group's website says Martin Wirth was an "invaluable part of Occupy Denver from the early days" and has been "fighting a valiant battle in court over his property." Park County assessor records indicate that Nationstar Mortgage LLC owned the home until it was sold in early 2014 to Federal National Mortgage Association, known as Fannie Mae. Fannie Mae filed the eviction case against Wirth in April 2014. Wirth was trying to fight the foreclosure in court by saying, "they had no ownership interest and this was proven by a Special Conveyance Deed that was notorized in the state of Texas conveying my property from Nationstar to FNMA on March 18, 2014." At one point, the Colorado Foreclosure Resistance Coalition even wrote a letter to the Park County Sheriff saying, "Members of the Colorado Foreclosure Resistance Coalition, Occupy Denver and MoveOn.org Denver Metro will be on the property in a NON-VIOLENT FORECLOSURE RESISTANCE ACTION to support Mr. Wirth and our constitutional rights." The group's letter asked the sheriff, "Please do not evict Mr. Wirth until he has had full opportunity to be heard in court." That letter was sent in the summer of 2014. The website said the judge hearing Wirth's case dismissed it. Wirth had scrapes with the law and money troubles that lead to multi-thousand-dollar judgments against him. At the time of the shootout, he had a pending court case for eluding a police officer, obstructing law enforcement and driving under restraint during a Jan. 20 incident, according to court records. Park County deputies issued him a summons in that case. In 2004, Wirth had a 2004 driving while ability impaired conviction. He received a suspended sentenced of 355 days in jail and was ordered to serve 10 days in jail, records state. In 2005, his probation was revoked and then reinstated to one year of probation. Court records show that a Platte County School District board member obtained a permanent restraining order in 2005 which prohibited Wirth from contacting him. Details on why the man requested the order were not immediately available. At the same time he was fighting the eviction, Wirth ran for office. He ran as the Green Party candidate for State Senate District 2 in 2014. Wirth got 25 percent of the vote with 13,019 votes. He lost to Republican Kevin Grantham who still holds the seat. Wirth said he spent his "entire personal fortune of about $380" to run for office. Wirth's Facebook page photos and comments show he participated in several Denver demonstrations in late 2014 involving the Black Lives Matter movement. They included "die-ins" where people fell to the ground in protests against the deaths of black men in confrontations with white police officers in the United States. The demonstrations erupted around the country after Michael Brown, an unarmed black teenager, was shot and killed on Aug. 9, 2014, by a white police officer, in Ferguson, Mo., a suburb of St. Louis.